IDBI Bank Ltd is a Public Sector Bank and recruitments in the Bank are strictly through open competition and are always advertised in prominent newspapers and the "The Employment News" as well as displayed on the Bank's website i.e. www.idbi.com has not hired the services of any agency or individual to recruit personnel on its behalf or collect any money/commission/charges for training etc. General public is hereby advised to exercise caution while dealing with such unscrupulous persons/agencies. Applicants are advised to submit the application form hosted on the Bank's website at www.idbi.com on the dates mentioned below after carefully going through all the instructions contained in the Application Form and the instructions given in the advertisement. No other means/mode of application form/ printout would be accepted. Relaxation As per GoI guidelines. Educational Qualification Graduate from recognized University or equivalent. Experience An officer with minimum 5 years commissioned service in Army/Navy/Air Force or a Police officer not below the rank of Asst Superintendent of Police / Deputy Superintendent of Police with minimum 5 years of service or officers of identical rank in para-military forces with minimum 5 years service. i) Selection process will consist of Personal Interview (PI) before the selection committee. The Bank will undertake a preliminary screening of the application for preparing, if necessary, a shortlist of eligible applicants to be called for PI and decision of the Bank in this regard shall be final. Thus, merely fulfilling the requirement laid down in the advertisement would not automatically entitle any candidate to be called for PI. ii) The details regarding the time, date and address of the venue for the PI will be intimated to the short listed eligible applicants through Call Letters, which they should produce at the time of PI. Other instructions, if any, in this regard would also be displayed on the Bank’s websites. Applicants are, therefore, advised to visit the Bank's websites at regular intervals. Applicant will not be allowed to appear for the PI without the call letter. iii) The applicants may please note that the call-letter issued to them should not be construed as an offer of employment. Only `100/- (Rupees One hundred only) towards postal charges is payable by the applicants belonging to the SC or Persons with Disabilities (PWD) and Ex- Servicemen categories and `600/- (Rupees Six hundred only) towards application fee and postal charges by all other categories (i.e. General and OBC). Applicants are required to make payment of the fee in cash at any of the branches of IDBI Bank Ltd. (IDBI). Proforma of the challan to be used for payment through IDBI are displayed on the Bank's website. Applicants may download the challan and approach the bank branch for making payments. Please note that the challans would not be available in any of the branches of the bank and has to be necessarily downloaded from the Bank's website. The applicants are advised to fill their applications strictly as per the format provided by Bank on its websites (www.idbi.com). Filled in Application form along with relevant documents by ordinary post only. The application form complete in all respects and duly signed should be sent in a cover super scribed as “Application for the post of Security Officer – Grade B” and addressed to The General Manager – Recruitment Section, Human Resources Department, IDBI Bank Ltd., IDBI Tower, 21st floor, WTC Complex, Cuffe Parade, Mumbai – 400 005. 4 Date of Personal Interview Would be intimated through Interview call letters. 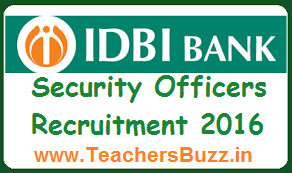 #IDBI Bank Security Officers Recruitment 2016 Notification#Detailed Advertisement for Security Officer in Grade B#Fee Payment Challan - IDBI Bank Ltd.#Application Form#General Instruction for the ApplicantsIDBI Bank Security Officers Recruitment 2016 Notification, idbi bank jobs, idbi bank recruitment, http://www.idbi.com/idbi-bank-careers-current-openings.asp, idbi bank Security Officers 2016 recruitment notification, idbi bank Security Officers 2016 recruitment notification,eligibility criteria,post details,registration age limit,qualifications. #Fee Payment Challan - IDBI Bank Ltd.